Dubai, United Arab Emirates: Following its largest and most influential outing to date in February, the unprecedented success of Gulfood 2014 has been demonstrated once again with the launch of Gulfood Manufacturing – a new, dedicated platform for the region’s fast developing processing, packaging and manufacturing equipment sectors. A spin-off of its industry-leading namesake, Gulfood Manufacturing – conceived to capitalise on growing demand for presence at the world’s largest annual food and hospitality trade platform – is primed to become the Middle East’s biggest-ever trade show launch when it debuts from November 9-11 2014 across nine halls at Dubai World Trade Centre (DWTC) later this year. “Introduced to consolidate and enrich nearly three decades of unprecedented Gulfood growth, the advent of Gulfood Manufacturing is the result of a visionary directive issued by His Highness Sheikh Mohammed Bin Rashid Al Maktoum, UAE Vice-President, Prime Minister and Ruler of Dubai,” said H.E. Helal Saeed Almarri, Director General, Dubai Department of Tourism and Commerce Marketing (DTCM) and CEO, Dubai World Trade Centre (DWTC). With several major international manufacturers already committing multi-billion dollar investments to develop world-class manufacturing and production capabilities in the UAE, Gulfood Manufacturing will support the region’s fast growing food processing industry, as well as the burgeoning halal food production sector – a key enabler in Dubai’s long-term vision to become a global Islamic Economy capital. “Gulfood Manufacturing will facilitate significant inward investment opportunities for major international businesses eyeing regional buyers, suppliers, logistics providers and storage and transport solutions,” added Almarri. “In addition to being a dedicated platform for industry players to purchase the plant, machinery, packaging equipment and business improvement tools that will enable them to compete effectively in global markets, the show will add further momentum to Dubai’s vision to be a worldwide halal centre at the forefront of the global halal food sector’s growth. 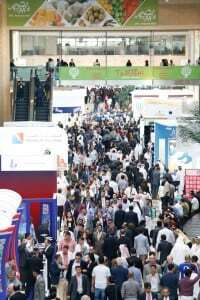 In addition to highlighting Dubai’s growing halal food manufacturing sector, Gulfood Manufacturing will comprise a cache of segmented, niche shows, conferences and technical workshops, including Ingredients Middle East, ProPack Middle East, Logistics Middle East and the Food Logistics Summit, as well as Dubai Municipality’s highly-regarded International Food Safety Conference. With leading international producers of high-tech products from Germany, Italy, Austria, France, the USA, the UK, China and Taiwan already committed to Gulfood Manufacturing, two of Europe’s powerhouse food processing and packaging machinery associations have stamped seals of approval on the new show. With a record 4,500 companies from 120 countries participating, as well as attendance by more than 300 Government ministries, top level officials and international industry leaders, Gulfood 2014 broke all its own participation and sales records, and is expected to generate record show-floor trading and year-round legacy sales numbering in the billions of US dollars. Having attracted 81,622 trade visitors from 172 countries last month, the 2014 show ranks as the biggest and most global edition in the event’s 29 year history. “Gulfood has grown consistently over the past 29 years to become the world’s most influential event for the food and hospitality industry and a world-class investment platform and business facilitator. The record participation and its unparalleled global reach this year emphasises the emirate’s significant role in contributing to Middle East market growth as well as Dubai’s 2020 vision to become a global events destination”, added Almarri. Gulfood’s tighter, more focused format, coupled with the successful staging of the World Food Security Summit and the launch of the specialist Halal World Food, highlighted the show’s role as a key global influencer and its host city Dubai’s leading role in steering the global food agenda. Inaugurated during Gulfood 2014, the World Food Security Summit – a Gulfood Leaders Event – welcomed over 300 high-ranking ministers, industry thought leaders, government representatives and sector-specific visionaries to address the importance of securing a stable, cost-effective and safe supply of food for the world’s growing population. Organised with the official support of the UAE Ministry of Water and Environment, the Summit was opened by H.E. Engineer Saif Al-Shara, Assistant Undersecretary, Agricultural Affairs and Animal Sector, who shared the Ministry’s commitment to improve global food security situation. Concluding with a strong message, H.E. Engineer Saif stressed: “Despite their best efforts, the world’s countries cannot achieve food security on the basis of their own resources alone; this requires close international cooperation.” He reiterated that the UAE remains “committed to the international goal of eradicating poverty and hunger,” citing the emirates’ active support of the 2012 Zero Hunger campaign. Hundreds of specialist halal food companies from over 50 countries participated at Halal World Food, a specialist, show-within-a-show concept launched at Gulfood 2014, which instantly established a position as one of the world’s biggest annual halal food sourcing trade shows. Halal World Food covered all halal-related aspects of global foodservice, retail and hospitality sectors to highlight the depth and variety of international halal products. By positioning Dubai as a ‘worldwide halal centre’ at the forefront of global halal food industry growth, Halal World Food generated significant inward investment opportunities for major international businesses eyeing regional buyers, suppliers, logistics providers and storage and transport solutions. In-line with Gulfood’s position as a key enabler in the global food policy arena, there are plans for future Halal World Food events to bring halal food policy-shapers and government organisations together to discuss the implementation of far-reaching standarisation and certification frameworks. With the strongest global representation to date, Gulfood 2014 welcomed 120 official national pavilions showcasing their respective country’s products and services. Ten new country pavilions participated for the first time including Bahrain, the Basque County, Colombia, the Czech Republic, Georgia, the Kingdom of Saudi Arabia, Mexico, Qatar, Romania and Vietnam. Countries with a long history of participation at the show including Australia, Brazil, Egypt, Italy, France, South Africa, USA and Germany reported excellent results and acknowledged the unprecedented global reach and the busiest show in the history of their participation. According to Brazilian Export and Investment Promotion Agency (Apex-Brasil), this year’s Brazilian pavilion at the Gulfood alone featured 77 companies, 32 more than in 2013. According to the Arab Brazilian Chamber of Commerce, the reach of the show is impressive and goes beyond the Middle East, helping Brazil to close business deals in many countries in the world. “I was surprised with how many people were interested in Brazil. I spoke to an importer from India who is looking to buy Brazilian rice and beans, one from Nigeria seeking poultry, one Australian shopping for sugar, and a Pakistani who was interested in Brazilian chocolate. I spoke to people from half the exhibiting companies, and all of them said they want to come back next year,” said CEO Michel Alaby. Returning to the show after a two year absence, the Japanese government recognises the MENA region as one of the high potential markets for Japanese products and Gulfood a great opportunity to expand their reach to other markets. “This year, we had around 2000 business discussions on-site, 250 potential contracts and at least 50 million Japanese Yen (approx 1,796,250 in UAE Dirhams) in terms of values of contracts, including the prospective ones. For this reason, definitely, we are planning to participate again in 2015,” said Mr. Terumitsu Kurisu, Director of Japan External Trade Organisation (JETRO). Gulfood has become the preferred platform for niche companies looking for new opportunities to raise awareness about their products and expand their presence into other markets. In addition to being a strategic platform for buyers and sellers across the global food industry to conduct direct business face-to-face, Gulfood 2014 hosted a number of key industry competitions rewarding talent, innovation and sector leadership. These included the Emirates International Salon Culinaire 2014 – an annual competition endorsed by the Emirates Culinary Guild and World Association of Chef Societies, an Innovation Gallery highlighting leading F&B products that have earned Gulfood Awards, and the debut of the Barista Bonanza in partnership with the Speciality Coffee Association of Europe (SCAE). Industry excellence has been recognised at Gulfood Awards, where an international panel of independent industry experts judged more than 250 entries from 19 countries. Twenty different accolades were presented including: best newcomer brand or business, best new halal food, best environmentally sustainable initiative and best trade stand. Innovation was a key highlight this year and was recognised in products, foodservice and catering equipment. Gulfood is a strictly a trade-only event and is open to business and trade visitors from within the industry only. Gulfood 2015 will take place from 8-12 February, 2015, at DWTC. For more information, please visit www.gulfood.com. Gulfood Manufacturing is the new home for ingredients, processing, packaging and food logistics providers who service the rapidly growing food and beverage production industries established in the Middle East, Africa, Far East and Sub-Continent. The event provides food manufacturers with the ingredients, equipment and business improvement tools that enable more efficient production and distribution.